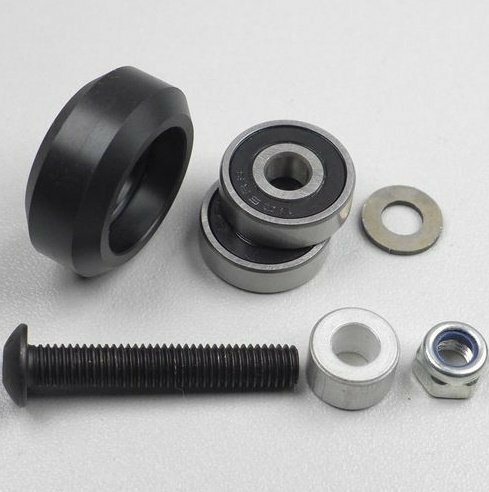 These, pre-assembled Delrin Solid V wheels are capable of sustaining heavy loads with negligible deflection and wear as required for applications like DIY CNC machines, Routers etc. They are CNC machined wheels, with high tolerances and lend to precision motion. 01 x Delrin Solid V wheel, 02 x 625 2RS Precision Bearings. Do not forget to add eccentric spacers and aluminium spacers to your order to use with your builds. These wheels are compatible with V Slot Aluminium Extrusions sold on our website and Openbuilds V Slot. However, if the V Slot is bought from any other source, please check for compatibility.